Torment: Tides of Numenera, the isometric science-fantasy RPG currently in early access, is coming to a Steam store equidistant to you and everyone else because it’s digital on February 28. Will Torment claim a place in our list of the best RPGs on PC? Torment: Tides of Numenera bills itself as the “thematic successor to Planescape: Torment, one of the most critically acclaimed role-playing games of all time.” Planescape, in case you don’t know, featured an immortal protagonist who traveled the world reclaiming memories of his previous lives. Heavily story-driven it was praised for its writing, characterisation and setting. 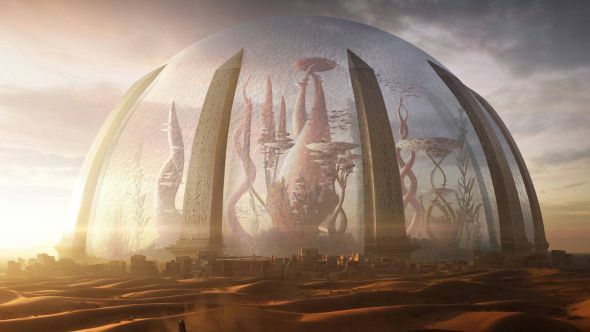 In Torment’s backstory, someone discovered a way to use numenera – advanced devices left by an ancient civilisation – to jump between bodies and cheat death. In doing so, he awakened a deadly force called The Sorrow, who set out to destroy him and all his previous bodies. You take the role of one of those bodies. Torment is a single-player isometric RPG in the style of Baldur’s Gate. This old-school RPG has been enjoying quite a resurgence lately, with such recent hits as Tyranny and Divinity: Original Sin. Torment is set a billion years in the future in a post-apocalyptic world conceived by writer and pen-and-paper game designer Monte Cook, who has also worked on Dungeons & Dragons. Imagine high science and creepy magic blending in all sorts of weird and wonderful ways. Sound good? Torment is in early access right now, so you can give an early version a try by forking over £34.99 ($44.99 US) on Steam. If you’d like to pre-order a physical copy of the eventual release, head to the game’s website. The day one edition includes a CD of the soundtrack, a 100-page digital travelers’ guide, a printed map of the world and exclusive in-game armour. If you pre-order, you’ll also get an exclusive steelbook, though it’s not clear what it’s a bookof. Opting for the Collectors’ Edition gets you everything in the day one edition (except the travelers’ guide is physical, not digital), plus an 8-inch statue, an 80-page hardcover art book, and a necklace to wear in real life.